I had been meaning to show this film to my girlfriend anyway, and the sad passing of Ruby Dee yesterday made it seem appropriate. Dee was a towering talent, easily one of my favorite actresses despite the fact that she rarely had a lead role. Her performances in No Way Out, The Tall Target, Edge of the City, A Raisin in the Sun, Gone Are the Days, Buck and the Preacher and Jungle Fever are all great assets to those films… usually the best asset. Watching her last night, I got a little choked up every time she was on the screen, especially when she shared it with her beloved Ossie Davis. Of course, the pair of Dee and Davis is just one part of this stellar ensemble cast. Bill Nunn, Giancarlo Esposito, Rosie Perez, Danny Aiello, John Turturro, Richard Edson, Robin Harris, Frankie Faison, Samuel L. Jackson, director Spike Lee and his sister Joie. With smaller appearances by John Savage and Martin Lawrence in his big-screen debut. And lesser-known actors who perform just as admirably: Christa Rivers, Steve White, Leonard L. Thomas, Roger Guenveur Smith, Paul Benjamin, Steve Park, Ginny Yang. Yes, I realize I’m just listing names here. They all deserve their due. It’s a fantastic cast that gives this movie so much energy and complexity. It also sports a dynamite score and soundtrack (except the Al Jarreau song over the closing credits, which is pretty cheesy) and incredible cinematography by Ernest Dickerson. Though I wish the Blu-Ray featured the blazing red/orange filters that I’ve always associated with the look of the movie, this presentation still shows his masterful framing and movement. I’m not sure how many times I’ve seen Do the Right Thing. I estimate it’s somewhere between 6 and 12. Every time it manages to captivate me, entertain me, shock me, confuse me. From the opening images of Perez dancing like she’s battling all the demons of the world to the closing quotes by Martin Luther King and Malcolm X that form one of the film’s many contradictions and dualities, I am completely absorbed in the lives of this Bed-Stuy neighborhood. The movie grabs hold of you, occasionally giving you a breather (like the ice cube scene) but never letting go. Everything builds to a scorchingly intense climax, a fevered whirlwind of raw rage, panic and hate. This entry was posted on June 13, 2014 at 10:18 am	and is filed under Movie Reviews. You can follow any responses to this entry through the RSS 2.0 feed. You can leave a response, or trackback from your own site. I’m right there with you. I’ve seen the film at least 15 times now and every time I watch it get so absorbed that I have no idea what’s going to happen next. It’s one of the two films I consider absolutely perfect and is the quintessential American film. 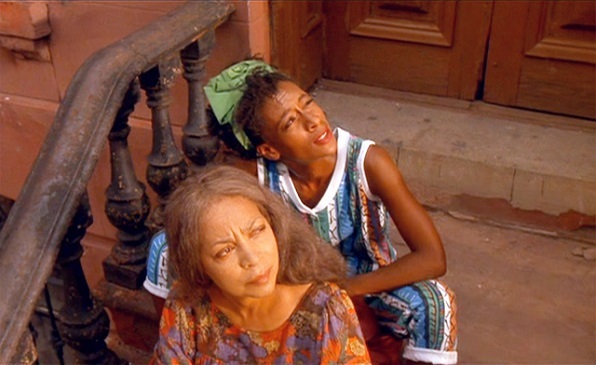 On Ruby Dee, she’s so damned good here, and I love that the complexity of all the characters allows for her to both be the paragon of advice and grace for the neighborhood, and one of the people screaming for the pizzeria to burn at the end. We’d get to see more of that side in American Gangster, but I love the nuance here, and for those who are unfamiliar with her work they get a superb taste here. Thanks for commenting! This was probably the introduction to Ruby Dee for most people of my generation. It wasn’t until much later when I learned more about her career, her activism and her relationship to Davis.